If you are a wine lover, this is one of the top things you must try while staying in Ljubljana. In this wine tasting you can try 7 different wines from all wine regions in Slovenia. You can also get to know the facts about all this wines from an expert sommelier in their 300-years old cellar. Otherwise Slovenia is the home of one of the oldest wine in the world. We also have one winery on every 70 people. Wine plays a very important role in our culture, so also our national anthem is a toast :). 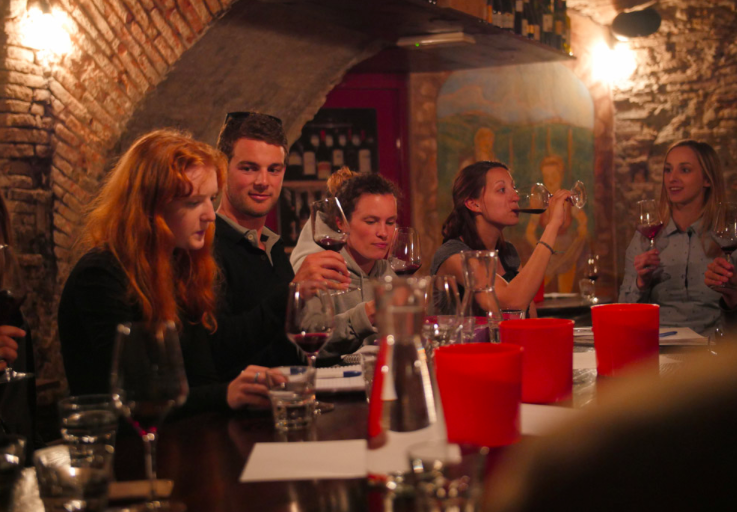 The groups for wine tasting are not to big – from 5 to 10 people, so just perfect for a more personal atmosphere. One important fact why would you like to choose this wine tasting among some of the rest in Ljubljana is, that the also offer some games through the tasting, it is interactive and way more fun! wine expert who presents the wines and answer all your question you may have about the wines. It starts every day at 7pm (and it lasts for 2 hours) on the address Dvorni trg 2 (Dvorni bar). You should reserve your spot on their website or ask us for more information. If you need a place to sleep, don’t hesitate to check our rooms. Enjoy :)! This entry was posted in Ljubljana. Bookmark the permalink.